From the box front: Frosted whole grain oat cereal with marshmallows. Compare to Lucky Charms Cereal. Made with whole grains. 12 vitamins and minerals. 0 grams trans fat. From the side panel: Betcha can't taste the difference... We guarantee it! 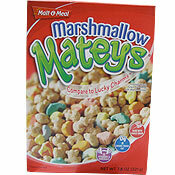 In a nationwide test, consumers agreed that Marshmallow Mateys taste every bit as good as Lucky Charms. Your family will love Marshmallow Mateys too. Nutrition profile: Each one cup serving contains 120 calories, 0 grams saturated fat, 0 grams trans fat, 35 grams carbohydrates, 1 gram dietary fiber, 13 grams of sugar and 2 grams of protein. The first ingredient listed is whole grain oat flour. The second is marshmallows. The cereal mascots Cool Blue and Li'l Oaty appear on bulk bags of this product. 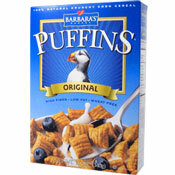 The same mascots appear on Malt-O-Meal's Golden Puffs and Honey & Oat Blenders. What do you think of Marshmallow Mateys? Way better than Lucky Charms. We Love It... Tastes Exactly Like Lucky Charms! I Buy The Jumbo Bags For My Family, Because We Can't Ever Get Enough Of It! We Snack On This Cereal All Day Long! Life changing. Delicious. Inexpensive. Every bit as good as Lucky Charms.